We took a barn down! 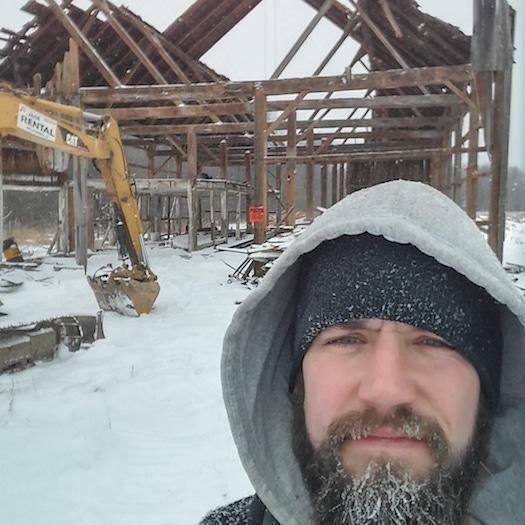 The monster we were working on up in the North Country has been down for a little while now and we're in the process of selling the lumber we reclaimed. We've been building relationships with people and companies in New York and elsewhere, including Silver Fox Salvage right here in Albany, selling larger bundles and smaller loads for individual projects. Know anybody who wants a beam or two (or ten)? We're your guys. We haven't committed to the next barn yet but we're looking at a couple. That there is very little a few guys (Adam, Nick, and a ton of help from Nick's father, Greg) with a little know-how and a couple of trucks can't do. That said, we've also learned a few ways not to take down a barn. We tried to do everything with a shoestring budget and the money from the contest came in very handy the majority of that. But, that said, if we simply bit the bullet and spent a little more than we were comfortable spending then we would have been able to use heavier equipment. There were times we had to take down sections of the roof, and we had to build a pulley system to do it. If we had rented a crane it would have been much easier -- it was cost prohibitive, but I wish we had. I think next time we are going to try to pick a barn that wouldn't require anything that big. Or rent a crane. If we had this one to do over again, we might rent a crane. But mostly we've learned that, yes, we can actually do this. We did a fair amount of market research, both formal and informal, before we started, but it's still been surprising how many people have reached out not just to say "Hey, that's really cool!" but also "I'm looking for some barn wood for a project, please let me give you some money." I'm not saying all of our product is just flying out of the barn (yes, we store our deconstructed barn in another barn -- and we never get tired of the Barnception joke), but the interest is real and at a higher level than we anticipated. I didn't expect that as many people would take their own initiative and reach out to me. I thought I would have to scrape for every customer. Lack of time. Neither of us is at a point in our lives where we're able to jump into this full time, so we have to be careful what we commit to and when. We know we can do the work, we know people want what we're selling, and we know we can grow the business. If somebody could wave a magic wand we could really get cranking, but for now we have to take things one step at a time. 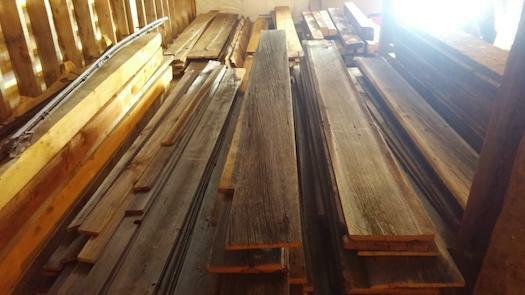 We were able to sell some wood to friends who wanted to build an accent wall in their dining room. They then had another friend -- Roger at Barley Woodcrafts, who is amazing -- process the wood and a local contractor -- Mark McLea -- do the install. Look how beautiful it is! (photo above) Being a part of a chain of great, local business people and having it turn out so well was a real treat. Sell what we've got and move onto the next barn, and in the meantime be on the lookout for opportunities to do smaller, discrete takedowns. 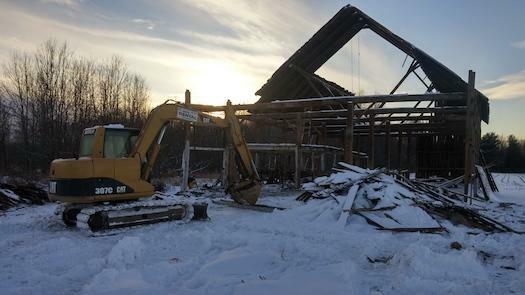 We've got our eyes on a couple larger projects, but one of the other things we've learned is what an undertaking salvaging a full size barn can be. For now we'll take things slowly, keep building our relationships, learn more about our larger customers' demand cycles and get the next big barn in the hopper. We're also working on increasing our digital footprint (know a good website girl/guy? ), and in the slightly longer term we'll want to increase our physical footprint as well. This is Nick's retirement plan -- which could actually happen fairly soon, 20 years in the Army goes by quickly -- so we're not going anywhere. On any given day, a trip to the many farm lands being put up for sale and the demise of these magnificent structures is a sad comment on our "new" way of thinking. Good luck to you fellas and recycling these magnificent structures is refreshing!! I hope that if they are asked to dissassemble barns that can be restored, they will refer the owner to a qualified restoration company instead!